1 Cook Rice according to pack directions using water and 1 teaspoon oil. 2 Meanwhile heat 1 tablespoon oil in a frying pan and brown mince and onion. 3 Add fish sauce, lime juice and sugar. Heat through for a few minutes, stir through coriander and cooked rice. 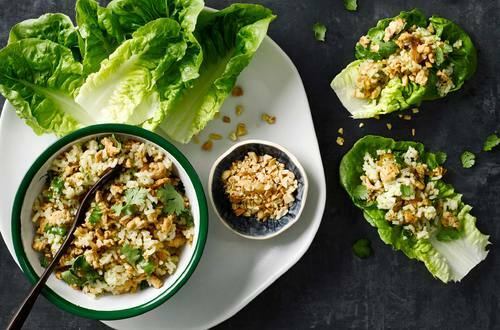 4 Serve wrapped in lettuce leaves and sprinkled with nuts.